AUTOCHECK REPORTS ZERO ACCIDENTS, 1 OWNER -- DO YOU LIKE GREEN? YES? 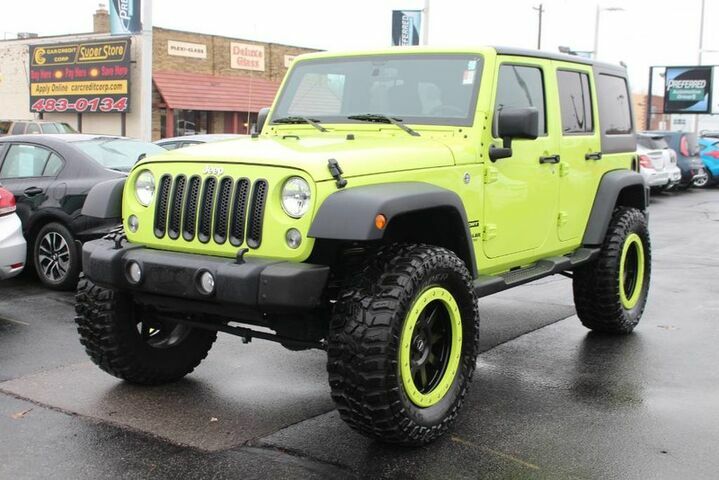 THEN YOU WILL LOVE THIS LIFTED JEEP WRANGLER! FEATURING CUSTOM TIRES WITH BLACK ALUMINUM WHEELS AND BODY-COLORED ACCENT RINGS, RUNNING BOARDS, HARD TOP, MATCHING SPARE TIRE, ALIEN SUNSHADE, AM/FM/MP3 SINGLE DISC WITH SIRIUS, USB AND AUX INPUTS, JEEP ALL-WEATHER FLOOR MATS, MORE! Preferred Auto Fort Wayne State is excited to offer this 2017 Jeep Wrangler Unlimited. This Jeep Wrangler Unlimited Sport has a tough exterior complemented by a well-designed interior that offers all the comforts you crave. This Jeep Wrangler Unlimited Sport comes equipped with 4 wheel drive, which means no limitations as to how or where you can drive. Different terrains and varying weather conditions will have no effect as to how this vehicle performs. We make every effort to ensure the data listed here is correct, there may be instances where some of the options or vehicle features may be listed incorrectly as we get data from multiple data sources. PLEASE MAKE SURE to confirm the details of this vehicle with the dealer to ensure its accuracy. Dealer cannot be held liable for data that is listed incorrectly.